The smaller version of the Standard model, the JR is great for areas to 700 sq feet. 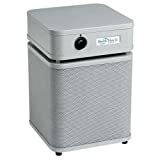 Perfect for 1-2 rooms, especially the bedroom: The HealthMate Jr. combines proven filter technology to provide the best overall protection from a wide range of airborne particles, chemicals, gases, and odors: Every minute, over 125 cubic feet of air passes through 6.5 pounds of Activated Carbon and over 30 square feet of True Medical Grade HEPA, providing air so clean it could change your life and how you sleep. 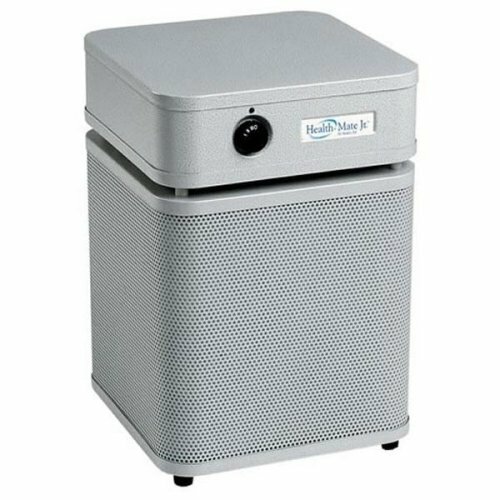 If it doesnt, Austin Air will refund your money within 30 days: The HealthMate Jr. addresses the complete spectrum of air cleaning, removing sub-micron particles, noxious gases and chemicals. Austin Airs 360-degree intake system draws air into all sides of the HealthMate Jr., passing it through a 4-stage filter. The result, more clean air delivered faster and more efficiently than any other air cleaner on the market: Features: Height 16.5". Width 11" x 11". 18 lbs. Perforates steel intake housing. 360�� intake. Available in White, Sandstone and Black. Airflow output from upper deck, directed one side. Bottom plate easily removed for filter access. Baked-on powder coat finish. 3 Speed control Switch. 1 amp, 80 Watt power consumption. Cleans 700 sq. ft. Meets HEPA standards. Manufacturer's US Warranty: 5 years parts, 90 days labor on defects in materials and workmanship. Filter has 5 year pro-rated guarantee: *Physicians Referral Program We will provide any model at 50% pricing to a physicians office, when shipped directly to the doctors office. Please place brochures/ marketing materials on the Unit for us to receive referral business from the display.